At the School of Music and Performing Arts, our teaching staff are committed to providing exciting and inspiring case studies as part of all our courses to help enhance and inform the understanding of students. 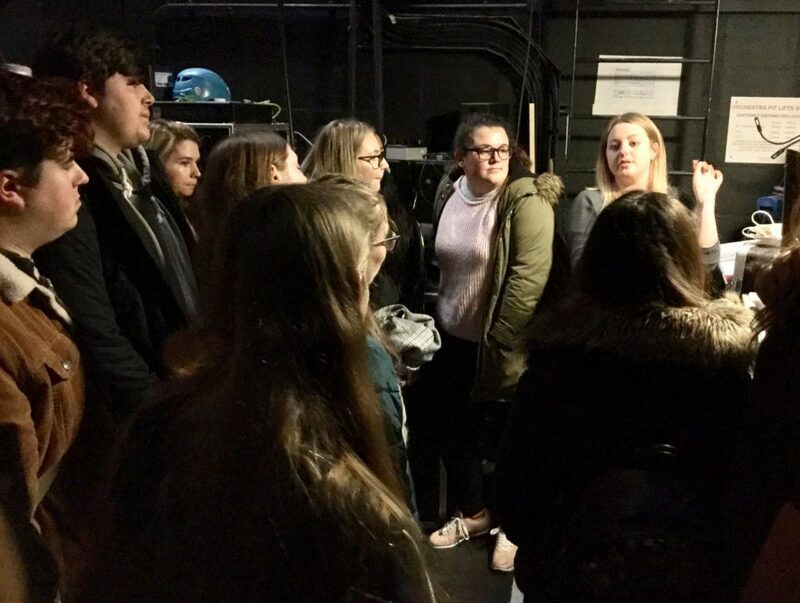 Every year for the past seven, Stage Management lecturer Christina Papaspyrou, has organised a fantastic case study opportunity for undergraduates studying this facet of Drama/Performing Arts. 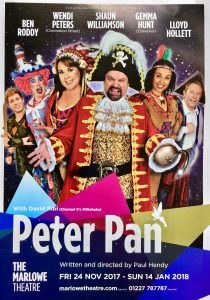 The Marlowe Theatre at Christmas time is absorbed with pantomime fever, as their latest offering, provided by Evolution Productions, appears on the schedule as early as the last week in November. Evolution are a local company who frequently have as many as eight different pantomimes running each season simultaneously up and down the country, and they have been the force behind the Canterbury Panto for well over a decade to great success. 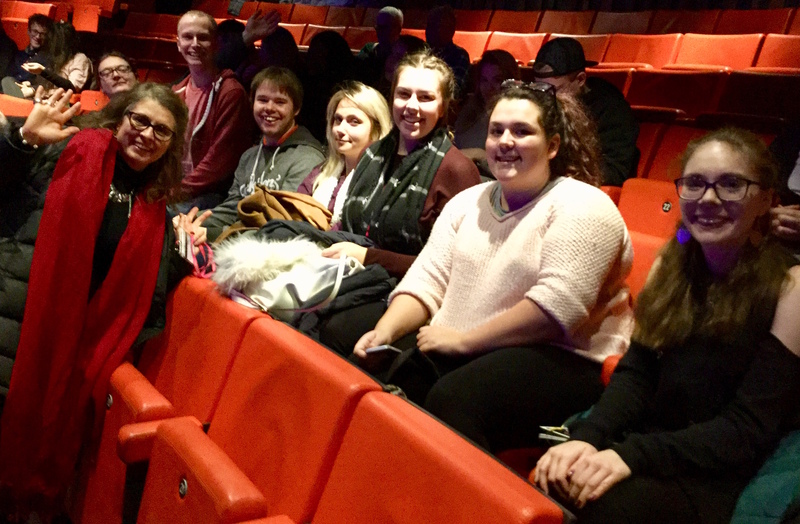 It was 2017’s production of the JM Barrie classic, Peter Pan, that our students were privileged enough to have been granted access to, from the closed technical rehearsal through to one of the final public performances on Wednesday 29th November. Can you describe the structure of the stage management team on this project? It is always different on every show. For Peter Pan, there are four of us. There is the Company Stage Manager (Alyssa) who doubles up as Deputy Stage Manager calling the show, the Technical Stage Manager who is in charge of all the flying systems and scene changes and there are two Assistant Stage Managers. There is also further support with the inhouse crew, such as two follow spot operators , sound one and two, flymen, a dresser, wardrobe mistress etc. You have two different types of flying on this show – can you explain the difference between them? There is the counterweight type that controls the cloths and the descending and ascending aspects of some of the set. This can also be used with people, the systems are built in and attached to our flying bars and are provided by an external company who deal with big shows like Wicked where this kind of thing is required. There are three flying tracks on stage that are attached to our flying bars and then there is the automated track that carries over the audience, however when flight on that is moved up and down that is manually operated. How many cues do you have in your book for a show like this? We can’t tell you exactly, but it will be around about six hundred. In one particular sequence in the show, there are so many cues in a short space of time that it averages one every three seconds. When you have a hiccup in the show, how do you stay with the book but still recover from the problem? When you get to know the show inside out, you tend to just memorise where a lot of the cues go without even looking at the book and can therefore call the next cue from wherever you happen to be standing at the time whilst dealing with whatever has occurred. There are also six other people on stage and they are not always relying on me so that if something does go wrong, they can take over and either deal with the issue or if its an ASM cover the book. But to be honest, things don’t tend to ever badly go wrong, not to the extent that the audience would notice. How is it working with this many children back stage? It does give an extra element to consider. You just need to ensure they know what they’re doing at any given time and have listened to you as they are likely more nervous than you are in the process. We are lucky because there is also an army of chaperones to keep them organised and make sure they get from A to B appropriately and safely. Who is involved in writing the risk assessment for a show like this? It is a collaborative effort between the Marlowe and Evolution productions. Steve, the Production Manager for Evolution has written it in this case in the first instance and it involves some generics like people moving props and just passing across the stage, but then you have to add in fire and human flying which makes what is a normal size assessment suddenly become a tome of a document. Every show is different and things need to be written up in different ways to ensure everything is covered. When War Horse came to the Marlowe recently, there were around three hundred pages of stuff that needed to be taken into consideration. 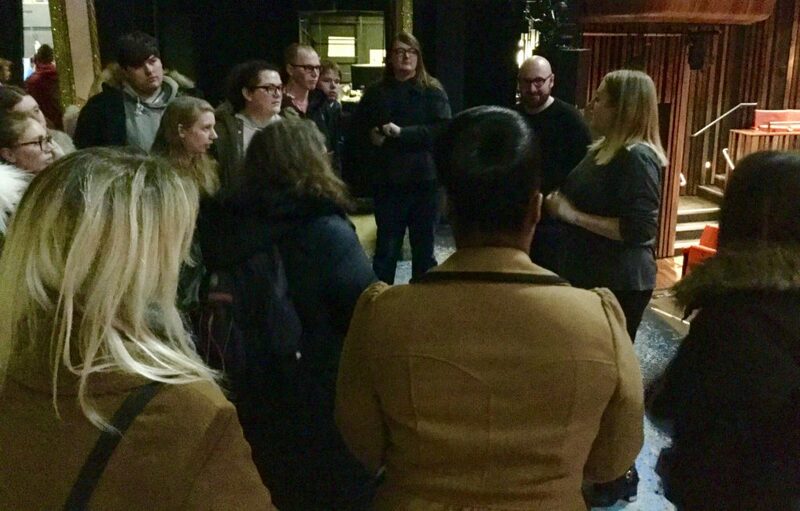 Do you have any top tips for making sure the rehearsal and performance process goes as smoothly as possible from a stage management perspective? Buy lots of pencils! Because you won’t have any when you leave. They all seem to disappear. Time keeping is obvious, but you’d be surprised at how important it is in this job because you have a certain amount of responsibility to make sure that your company stick to the rules, so if you’re late it sets a bad example to the others. In terms of making up your book, my biggest piece of advice would be to make it clear. So that if something happens to you and you can’t be there for any reason, it means that anyone else can read what you’ve written and potentially call the show. There’s nothing worse than getting really ill or something and you already feel terrible because you can’t be there and then someone who is going to cover you can’t read what you’ve written. Always keep that paper trail for every single cue sheet! Prepare for every eventuality. What is the get-out like for a show of this scale? We have to strike all of this in seven hours. As hard as that sounds with all the elements involved, we cannot spend any more time on it than that as we always have another show coming in straight after to get in the following morning. Depending on the show and its size we do have two teams working that tag in and out. There will be six trailers that help get this all out, for lighting, set and sound, and the same amount will then come in with the new show. What do you think the main challenges are from a stage management point of view for a show with so many elements? Children. Acrobats that aren’t from a theatre background, so require a bit of training before hand. It is just a very complicated show. Controlling sixteen people, technology coming out of your ears, 1200 people a night who are expecting it to go 100% smoothly. In addition, all the PR and marketing that is involved. Not to mention company happiness and morale – which is key in a show of this extreme length, which is unprecedented really. But it is so worth it when it all comes together. “Its really changed people’s outlooks, coming to things like this and studying stage management as a whole. Some of us have come from a performance background and now have completely changed our idea of what we want to do on leaving university and are considering more backstage roles now we’ve had these experiences.” – Lauren Woodrow.